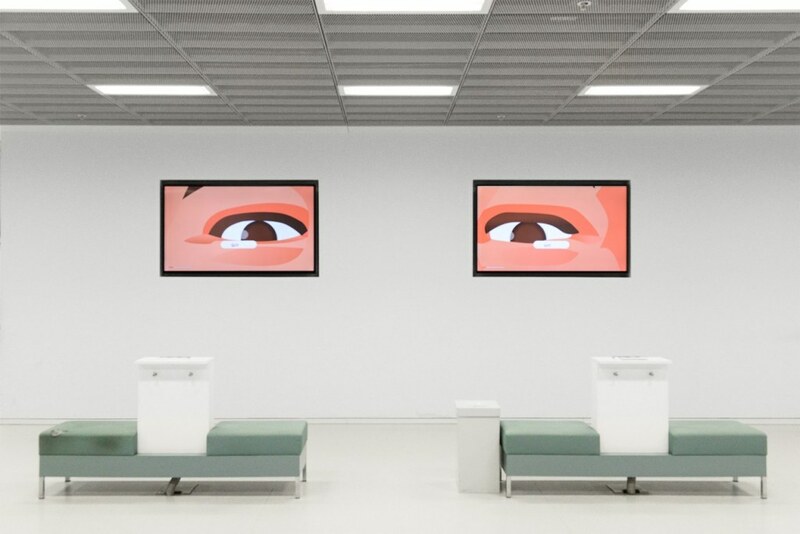 Installed on the 16 screens in the foyer of Stuttgart’s new public library, Speed Reading addresses the regime of self-optimisation and constant training. Eight of the most frequently taken-out books are being played back using a custom speed reading software with which accelerated reading can be trained. Additionally, the software developed by Schmieg performs a series of exercises that improve the perceptive apparatus. Thus, visitors do not only acquire relevant knowledge as fast as possible (from children’s books to novels), but also gain an edge over their competition thanks to their increased reading speed. However, the optimisation software seems to have developed a momentum of its own with the stream of words being accelerated almost beyond recognition. Yet, the eight pairs of eyes shown on the screens – close-ups of successful people taken from a popular stock-photography archive – tirelessly follow the text and exercises. Is it in fact possible to keep up with this tempo? Do we just need to try harder? And what stories are then being told by the readers’ eyes?